Week 2 of the competition. If you guys can make it happen that I win this week’s public vote the prize will go to my husband who has sacrificed a lot for me to follow my dreams and hasn’t yet had a chance to follow his. If you are using a Dutch oven, turn your oven on to 110 degrees Celcius. Place the beef suet in a pan on a low heat and allow to melt. You need 4-5 tbsp plus 2 tbsp for the tortillas. Cut shin into cubes and place in a bowl (put any bones to one side). Add the chilli powder and pepper to the bowl and make sure the meat is covered. When you have the desired amount take the pieces of suet out. You can also render all and put what is left over in a bowl. Allow to cool, cover, refrigerate and use later. 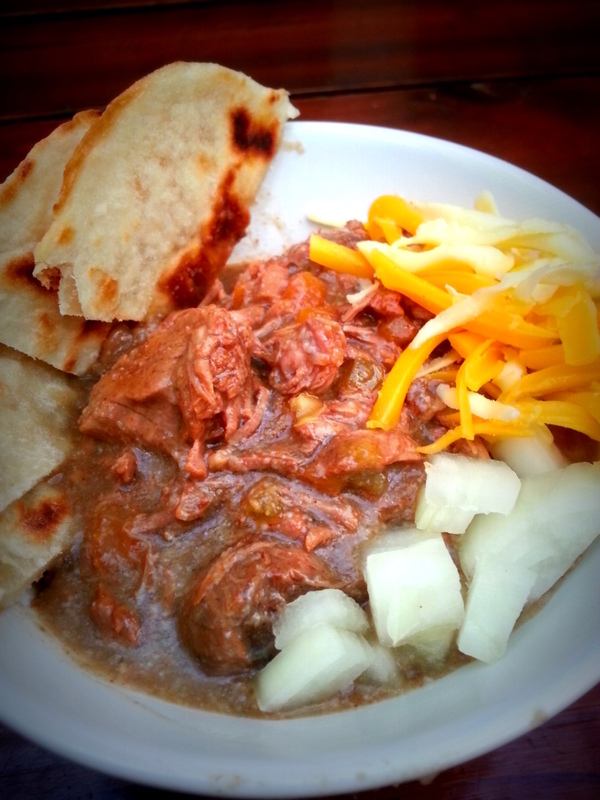 Remove 2 tbsp of tallow for tortillas and brown meat in pot. When seared on all sides, place meat in a Dutch oven or slow cooker. Fry finely chopped celery and carrot (from Soup Mix) until soft, deglaze pan with vinegar and pour all into your cooking vessel. Pop the Knorr Stock Pot in and pour in enough water to cover 3 quarters. Turn slow cooker on low or place Dutch oven into your oven and allow to cook for several hours (I left it overnight). Mix flour and salt. Add tallow and mix. Slowly add water until the dough becomes soft, kneading as you go. Cover with a towel and allow to rest for a few minutes. Warm a pan on a medium heat. Roll dough into even balls. Then roll each ball out into tortillas (I used a tortilla press. Fry them in the pan and leave on one side until they just start puffing up and then flip them over. Serve warm with tortillas, grated cheese and onion on the side.